Your digital audiobook copy of EntreLeadership will be available as a download link in your order confirmation email after check-out. Kindle (.Mobi): This format is compatible with the Amazon Kindle as well as the Kindle app for iPad, iPhone, iPod Touch, Mac and PC. ePub: This format is compatible with the iPad, Sony Reader, iPhone, Kobo, Nook, BeBook, Desktop Computer and other eBook Readers. 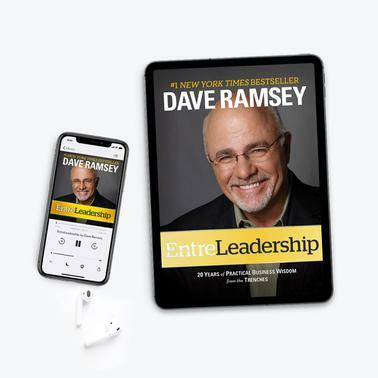 Perfect for the on- the- go entrepreneur, this bundle contains the eBook and audiobook of the best-selling, EntreLeadership. The audiobook is read by Dave and runs 7 hours and 19 minutes and you can choose from three available eBook formats (iPad/iPhone, Kindle, Nook). Dave has grown his company into a winning national brand with more than 400 team members who have impacted millions of lives. EntreLeadership is how he did it, mistakes and all. This is 20 years of real-world experience with all the sweat, tears and prayers. This is how his company has been named one of the Best Places to Work in Nashville seven times. It’s proven. It’s practical. And it’s how you can do it too. Whether you lead a team of two or 200, you can grow your business to where you want it to be. Reaching your dream is no longer a question of "What if we could?" You can. EntreLeadership is how. To get your downloadable product, simply complete your order and then open the order confirmation email you will receive at checkout. Click on the link in your confirmation email and your E-book will begin to download. E-Books are delivered in iBooks for iPad/iPhone (ePub) and Amazon Kindle (Mobi) formats.